The thinness of the Samsung ATIV Book 9-Lite notebook doesn't leave much room for ports. 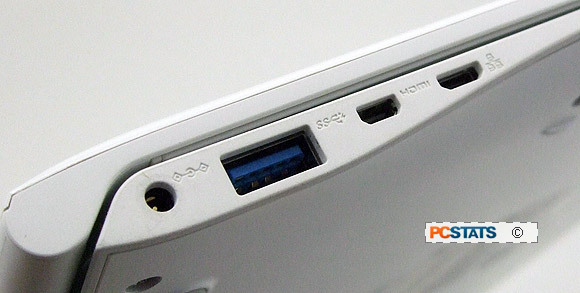 Along the left side of the notebook we find a DC power socket, USB 3.0 port, micro-HDMI video output and miniature connector for the supplied RJ45 LAN dongle. The dongle is required if you get your internet via a standard Ethernet (wired) cable. 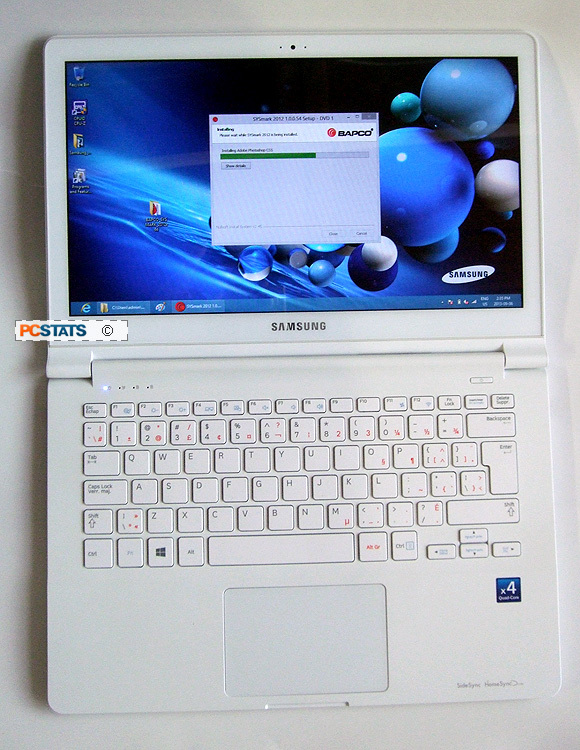 In our tests we just used the ATIV Book 9-Lite's comprehensive wireless LAN which supports 802.11bgn WiFi. The RJ-45 wired LAN dongle comes with a dust cap to protect the mini connector end, so tossing it in your bag when it's not needed won't be an issue. 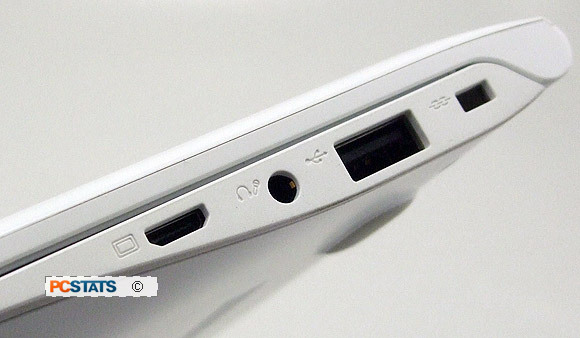 On the right side of the ATIV Book 9-Lite is a mini-VGA port, 1.8" headphone/microphone jack, USB2.0 port and Kensington lock hole. Samsung neglect to include the mini-VGA dongle for connecting a desktop monitor. The adaptor costs an extra $40. Samsung's ATIV Book 9 Lite notebook comes with a nice 13.3" widescreen display that is touch sensitive. That means you can drag your fingers across the display to interact with Windows 8 directly, just as you would on a Tablet or iPad. The 16:9 aspect ratio screen is sized just right for watching full screen movies on, but with only 128GB of storage (99GB of which is usable) there is limited space for archiving an extensive movie collection. The capacitive touch screen panel supports up to 10-points for multi-gestural inputs (like kids finger painting!). The display has a native resolution of 1366x768 pixels which looks quite good from head on. The viewing angles are nothing exceptional, but we didn't find them too limiting while testing the ATIV Book 9-Lite either. I'd estimate them to be around 140 degrees vertical - 150 degrees horizontal. The AMD Radeon HD 8250 graphics core supports multiple displays, meaning you can extend or duplicate the Windows 8 desktop to external monitors or HDTVs via the mini-VGA or micro-HDMI outputs. The screen tilts almost completely back which allows this notebook to sit virtually flat on a table top, just as a tablet can. 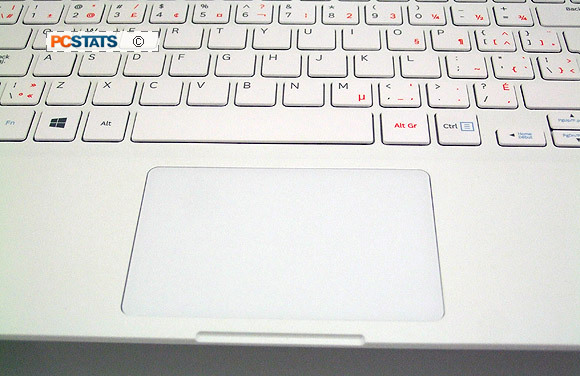 The ATIV Book 9-Lite has a very comfortable 81-key keyboard that's large enough for folks with big hands. 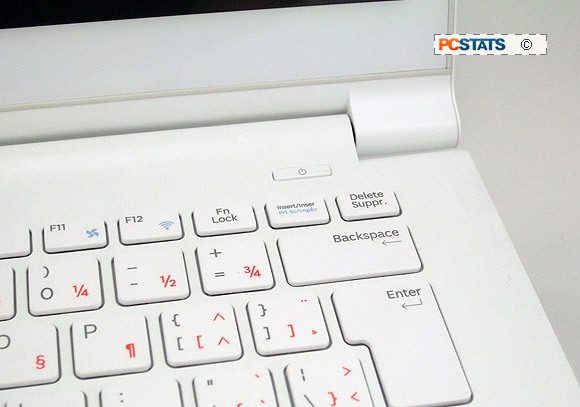 The keyboard measures 11" across, the same as a standard desktop keyboard, but uses flat, tile style keys. The keys have a 19mm pitch, 2mm stroke and thankfully are not coated with a glossy material that feels weird under ones' finger tips. The keyboard layout is logical, with a set of narrow arrow keys tucked below the right shift key so they are in easy reach. 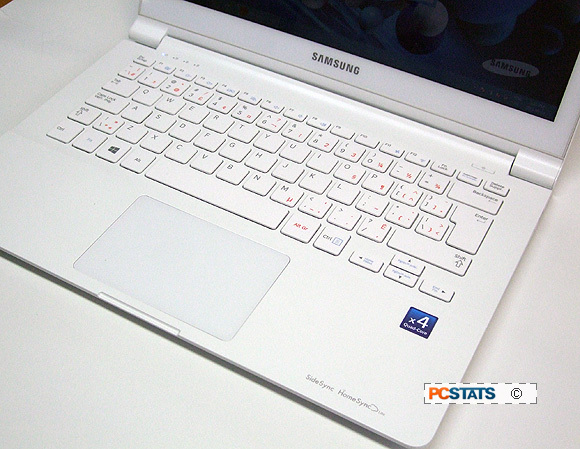 The Samsung ATIV Book 9-Lite presents a very clean appearance. 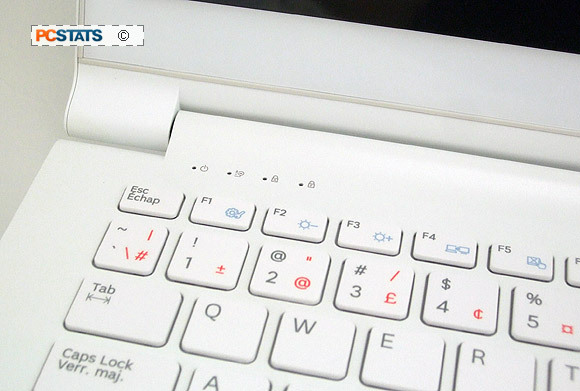 Above the keyboard are four status indicator lights; one for Power, WiFi On/Off status and Caps lock status lights. On the right hand side there is just a power button. Minimalism at its best! The gestural touch pad supports multi-finger command short cuts for common every day tasks such as scrolling up or down a long web page, going back or zooming. 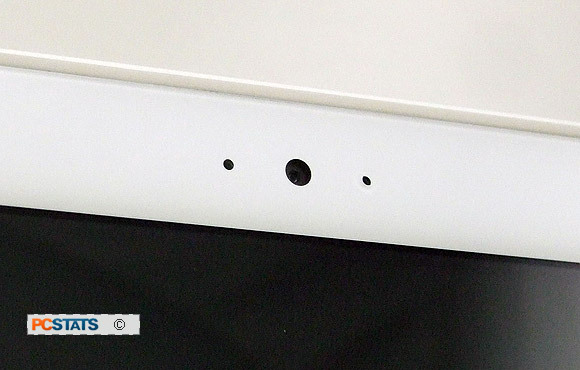 The left and right buttons are integrated into the touch pad at the bottom corners. With Skype now under the Microsoft umbrella, you'll be hard pressed to find a notebook these days without a built-in web camera for video conferencing. Samsung's ATIV Book 9-Lite comes with a useful 720P HD web camera, internal microphones and a pair of 1.5W stereo speakers. At the heart of Samsung's ATIV Book 9-Lite notebook is a mobile 1.0GHz, AMD quad-core processor which sips less than 10W of power. The CPU's four cores simultaneously process four threads between them and depending on system load, Turbo Core can increase CPU clock frequency up from the base 1.0GHz to a maximum 1.4 GHz. 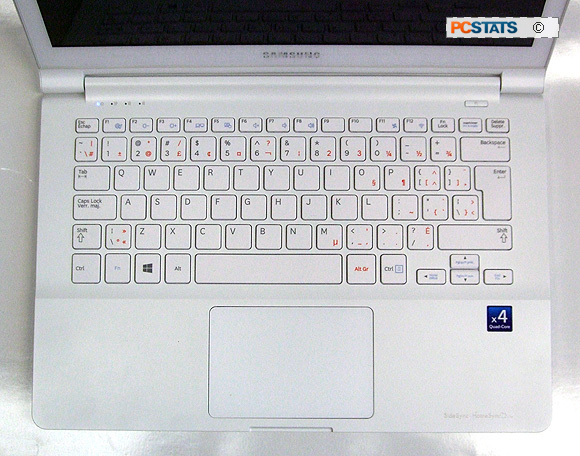 We'll take a close look at this next as PCSTATS cracks open the ATIV Book 9-Lite for a look under the hood.